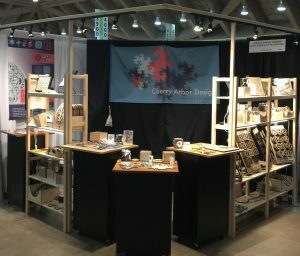 We had a great show in Atlanta with the American Craft Council on March 15-17, 2019. We have a whirlwind of shows until May, then some time to breathe and get some exciting new ideas into production in time for the Ann Arbor Art Fair this summer. We send out one newsletter a year, in November, highlighting our new products. Sign me up! Cherry Arbor Design is a wife and husband team. 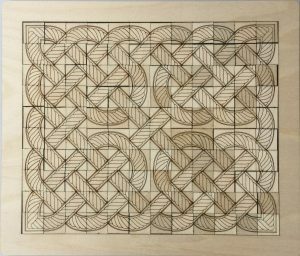 Our handcrafted products explore the intersection of math and art, making everything in our Ann Arbor workshop. Our first geometric tilings were developed to reach students who felt they could not learn geometry in the traditional way. The puzzles and geometric forms we design and make now are still centered on important mathematical concepts. We love the way these forms connect to shapes found in nature. We hope you do too. We participate with the American Craft Council, a supporter of craft artists and the largest nonprofit producer of craft shows in the country. In addition to its shows, ACC works to connect creative communities through craft-focused programming and its award-winning magazine, while providing educational resources through its craft library and archives. We are now on the Amazon Handmade pop-up shop, curated by the American Craft Council.